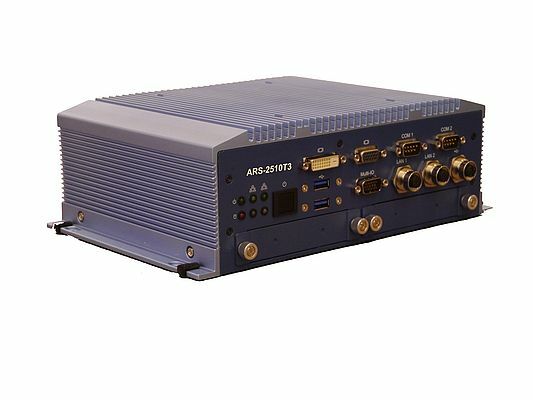 Advantech's ARS-2510T3 Box PC for railway applications complies with EN 50155 and related regulations in order to fully fit the railway environment. It ticks the three essential boxes that are scalable configuration, multi-functionality, and high performance. On board, the product serves as a train communicator or controller, and can be used for number of different purposes, such as on-board DVR, multi-media server, train to track/ground bridge unit, or supervision & control unit. One of the key strengths is its combination of Intel Core I7 platform (3rd generation CPU platform) and T3 temperature level (rail certification specifications range from T1, T2, T3 to TX). T3 describes the relative temperature range, from minus 25°C up to 70°C, or 85°C for a duration of 10 minutes. Another feature of note is the railway-specific power supply, compliant to EN 50155 power input levels 24V/48V/72V/110V, through M12 circular-type connectors. The Box PC is equipped solely with circular and screwable connectors. Furthermore, the computer has protection coating that conforms to IP50+. This inner lining layer prevents the ingress of dust and moisture, and so ensures its high performance status is maintained over time. Thanks to its ready-to-install availability and various intrinsic functions, such as dual display, the device can be used for several kinds of railway applications. Two multifunctional expansions slots providing SATA, USB and PCIe signals also allow for flexible and scalable configurations. In addition, the three, internal MiniPCIe slots offer the option of a super connectivity configuration with WiFi, LTE/3G, GPS and GSM-R. Huge added value lies in the remote management features ensured by the Intel AMT/vPRO, included in the Core i7 processor, and the Advantech iManager system. Together these help optimise the management of networked computing assets.